What is VoIP; Voice over the Internet explained. What is VoIP ?, a tutorial. VoIP (Voice over Internet Protocol) is a great technology that allows you to make and receive telephone calls over the Internet and has been in the mainstream now for going on 9 years. It can also be referred to as an Internet Phone. VoIP(Voice over IP) enables you to make cheap telephone calls over a broadband Internet connection, (usually a DSL, broadband cable connection, or T1), instead of using your regular telephone service. You can connect to regular telephone numbers locally or in other parts of the US or Canada, or anywhere else in the world, usually all for one low price for US and Canada, eliminating long distance fees by using a VoIP service from an "Interconnected VoIP Provider", (which most VoIP providers are). In addition, you will usually have low international phone call rates to other countries. The savings can be substantial, with lower fees and taxes levied by traditional telephone carriers. Plus, most VoIP providers offer services with "unlimited" calling plans and an array of features all for one monthly fee. A requirement for a VoIP connection is a high speed internet connection, such as cable, DSL, T1, or even wireless, as long as the wireless provider's bandwidth meets the minimum requirements for the VoIP provider you choose and their connection is stable enough to offer a connection without packet loss and jitter. How does VoIP work? Voice over IP explained. First, voice is converted by an ATA (Analog Telephone Adapter) or IP phone, from an analog signal to a digital signal. It is then sent over the Internet in data packets to a location that will be close to the destination. Then it will be converted back to an analog signal for the remaining distance over a traditional circuit switch (PSTN) (unless it is VoIP to VoIP). Your call can be received by traditional telephones worldwide, as well as other VoIP users. VoIP to VoIP calls can travel entirely over the Internet. Since your voice is changed to digital (so that it can travel over the Internet), other great features such as voice messages to email, call forwarding, logs of incoming and outgoing calls, caller ID, etc., can be included in your basic calling plan all for one low price. Many of these special features are great for the small business person who relies on their phone service to be more a information center rather than just a telephone. Lower monthly telephone bills; cheap Long Distance and cheap calls. Unlimited monthly calling to certain locations eliminating long distance charges and plans with unlimited International calling. Additional features; all included in your one monthly flat rate. Lower prices on International calling. Virtual numbers; numbers that ring in on a primary number and can be from other areas, even other states. Portability (LNP), or the ability to take your phone service with you. Certain people are going to benefit more greatly from VoIP than others. Entrepreneurs and small businesses are such great candidates for VoIP that it would be hard to present an argument against getting a VoIP service. It's not just the unlimited long distance calls (US and Canadian) that are the primary motivation, it is also all the advanced features that are part of many provider's service. Getting a state of the art communications system, one that up until now would cost several hundreds of dollars a month with a large initial outlay, for under fifty dollars a month is incredible (and with very little upfront cost). Adding a VoIP line or two can greatly add to a small business's communications features, save money and increase revenue. Consider adding a line, as a partial solution, keeping a regular copper line, especially if you fax heavily or use DSL (see our tutorials for more information about these two suggestions). Look into the features that will benefit your business plan, they may be more than you expected. Read about the Top 5 Problems with VoIP. 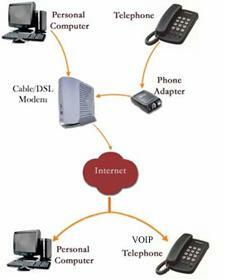 We at VoIP Mechanic believe that an educated user enjoys and appreciates new technology more. We hope you will find our site useful and by using it will gain important information that will help improve your VoIP connections. What should be the criteria for deciding on which provider to select? If you notice where we place the monthly price, it is at the very last place. This is because, in most cases, the difference between a few dollars a month is marginal compared to features, good customer support and good technical support. How can VoIP Mechanic help you? What to consider when making the move to VoIP. Installation: How to and issues. Help correct echo and buzzing. Help to distribute the VoIP throughout the premise. Help with understanding some of the terms and words. When you choose a VoIP provider consider criteria other than price. First and foremost, what type of customer service and technical support do they offer. Second, what are the features included, and have they added any new features in the past 4-5 months. The reason for this idea, is that if they have added new features recently, they are apt to continue. It also shows that they are expanding and looking at making their product grow and improve. Third, are they a company that will grow as your needs grow.